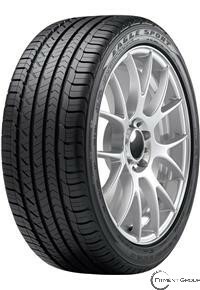 A powerful sport performance tire with enhanced responsive handling and strong grip in all-season conditions. The proven asymmetric tread offers both responsive handling and exceptional all-season grip. An innovative tread compound that delivers outstanding wet and dry performance, with enhanced grip in ice and snow. Full-depth sipes help create biting edges for confident grip — even as the tire wears. The rim protector helps defend against accidental curb damage.